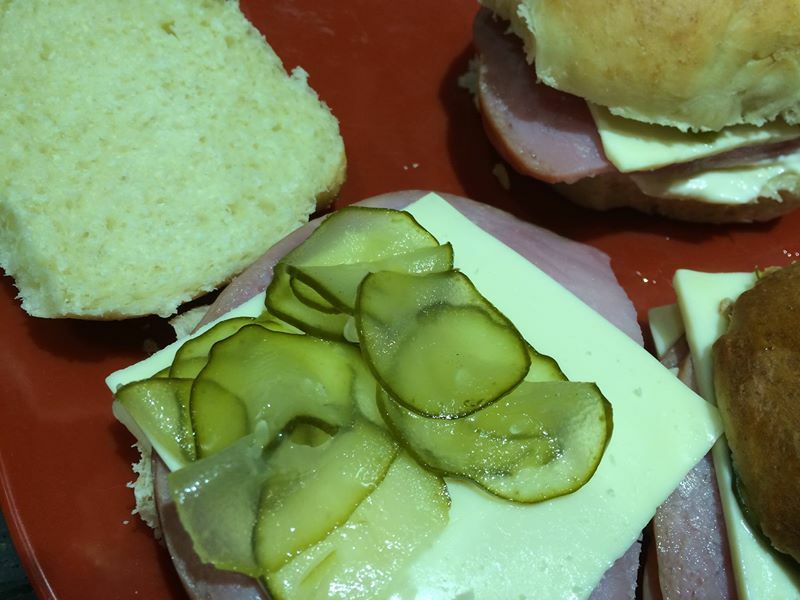 You will love these garlic sweet dill pickles because they are the best! The flavor of garlic with dill is awesome. 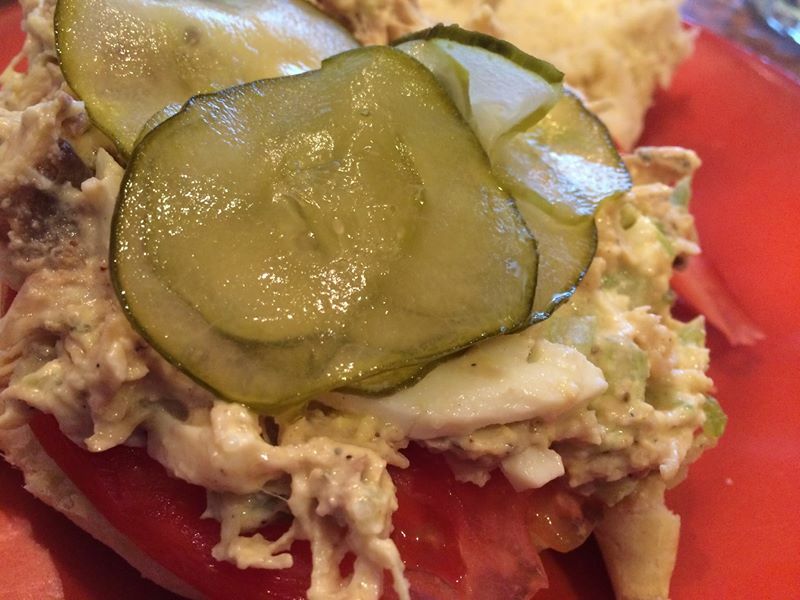 They’re great on grilled burgers, chicken salad, or ham and cheese sandwiches. Oh yes, they’re pretty good just by themselves – which is why an opened jar never lasts long at my house. Not only are they delicious, they’re also soooo easy to do. We’re talking the usual sugar, vinegar, water and salt; add some fresh dill and a garlic bud and (of course) the sliced cucumbers. I can these by the quart and by the pint. The size jar I open up depends on how many people will be eating at my table that night. 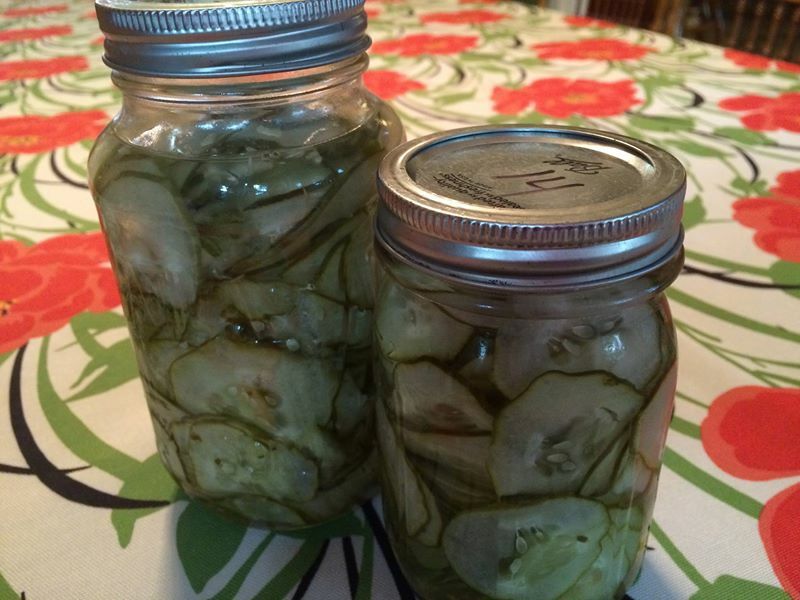 For each pint jar, you will need two cups of sliced cucumbers. You can slice and measure all of them ahead of time, or just do it jar by jar. Then you’ll know exactly how much brine you’ll need. I got this recipe from a friend, and later I also found it in the Mennonite Country Style Recipes cookbook. So if your garden is producing an excess of cucumbers this summer, wash and slice those cukes and add the garlic and dill; then pour in the liquid and you’re all set. This recipe makes enough brine for 6-8 pint. If you think you don’t have a way to hot water bath something, you’re wrong. Use a large kettle with a rack. If you don’t have a rack, you can use slats of wood or put a towel in the bottom. You need something on the bottom of the kettle so the jars won’t be touching the bottom. Put the jars in the kettle and put enough water in to come up to the necks of the jars. Bring water to a boil and boil for 8-10 minutes. When you take them out of the water, the lids might not be sealed. Give it some time and before long, you’ll hear that popping sound that signals the lid is sealed. These jars were canned in 2014, as you can see from the writing on the lid. My pickle shelf is almost empty . . . . So easy to prepare and simple to can. And, of course, delicious and easy to serve! This recipe is per quart but you can halve it and do pints instead. 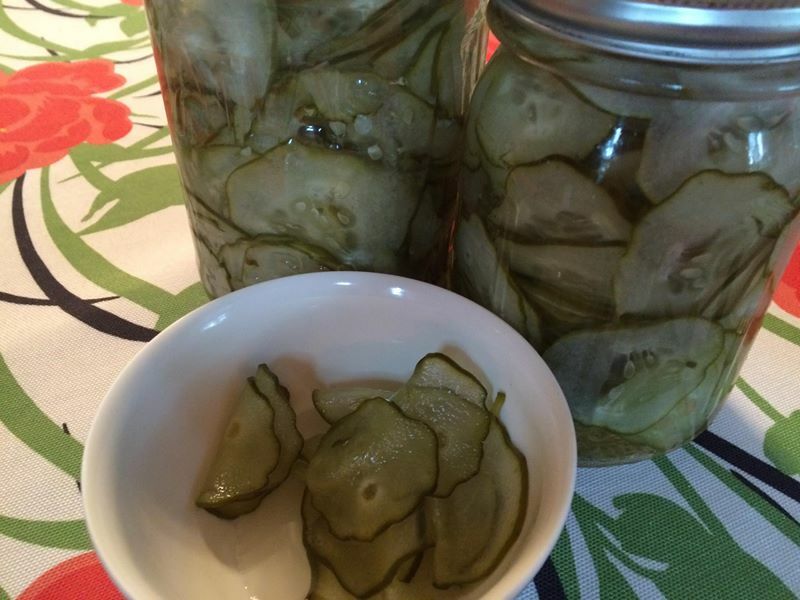 Wash and slice medium-size pickles ¼ inch thick into jars. Combine the other ingredients in a saucepan. Heat to boiling, then pour over the cucumbers in jars. Process in boiling water bath for 8-10 minutes. Let sit in jars for 1-2 weeks. Oh dear. I’m sorry about that. The brine (liquid) makes 6 pints. That’s stated at the beginning of the recipe, but you are right. My recipe doesn’t tell you how many cucumbers. This depends on the size and length of each cucumber. You will need 2 cups sliced cucumbers per pint jar. What I like about this recipe is that I can wash and slice my cucumbers and put them into the jars. Then I know how much brine I need. I can double or halve the recipe depending on how many jars I have filled. 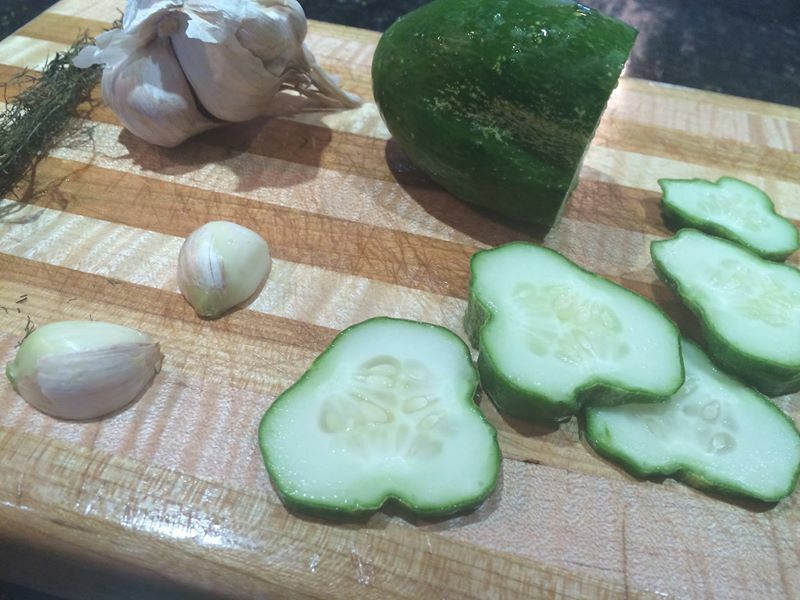 I usually just put the garlic and the dill in the bottom of each jar and then slice the cucumbers on a cutting board and toss them in the jar. When one jar is filled, I do the next one. But you can slice them all and measure how many you have. Then you will know how many jars you need. I hope this helps! I will edit the recipe to make it easier to understand. Thanks for pointing this out to me!